Key Lime anything makes me happy–isn’t it that way for everyone? 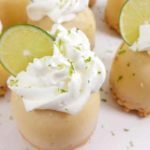 These healthy Key lime Custard Bites are the perfect healthier dessert recipe and can be made in the Instant Pot or oven! I use my egg bite molds, but you can use a cupcake tin as well. Are these Instant Pot key lime pie custard bites healthy? 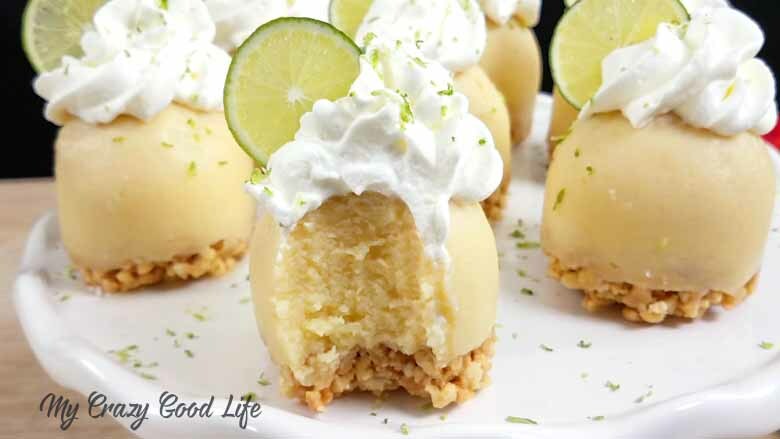 These key lime pie bites are healthier than most! Made with an almond milk base and sweetened with honey, I love bringing these to happy hour to share with friends–I know it’s a healthier alternative to a traditional dessert. I prefer not to use cream cheese or graham cracker crust (made from graham cracker crumbs), so I created this recipe using peanuts and coconut oil for the crust and unflavored gelatin to thicken. Key lime curd is traditionally made with sugar but I used honey and key lime juice instead. Making desserts healthy is a great way to make sure I’m sticking to my lifestyle goals while also being able to indulge! It never hurts when they’re super tasty and deliciously shareable. Do you have more delicious and healthy desserts for me to try? Of course I do! Here are some more recipes that I think you’ll want to try if you are looking for healthy or 21 Day Fix approved desserts. Is this key lime pie without condensed milk? Yes! I made these as healthy as I could for you–no processed ingredients here! I hope you enjoy this healthier treat. After being on 21 Day Fix, which calls for whole foods, I’ve learned a thing or two about making recipes without all the unnecessary and added junk. 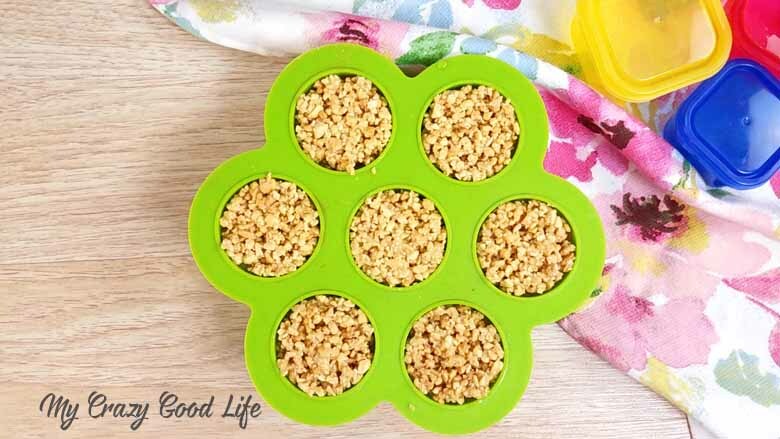 These key lime pie bites are a healthy dessert and they contain more recognizable, whole food ingredients. You know by now how much I love my Instant Pot. 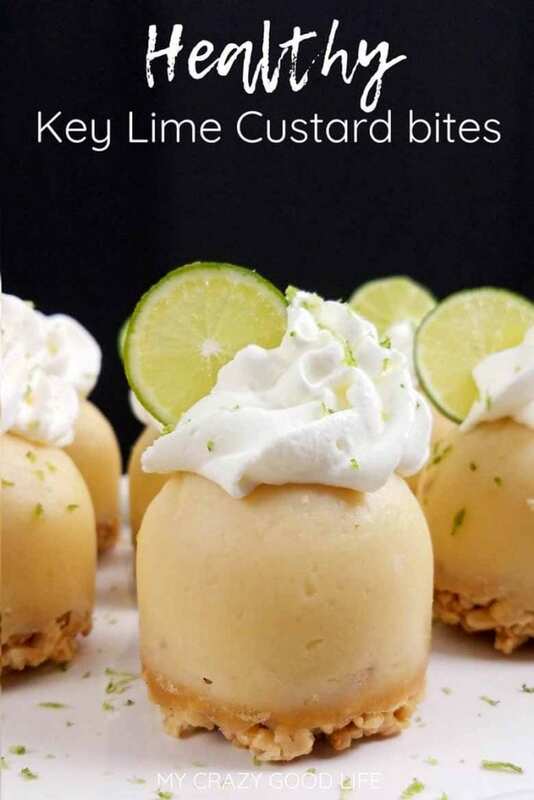 These healthy key lime pie custard bites are no exception. They are amazingly easy in the Instant Pot and it’s one more awesome use for my baby food molds! 1) In a food processor mix together all the ingredients for the filling. 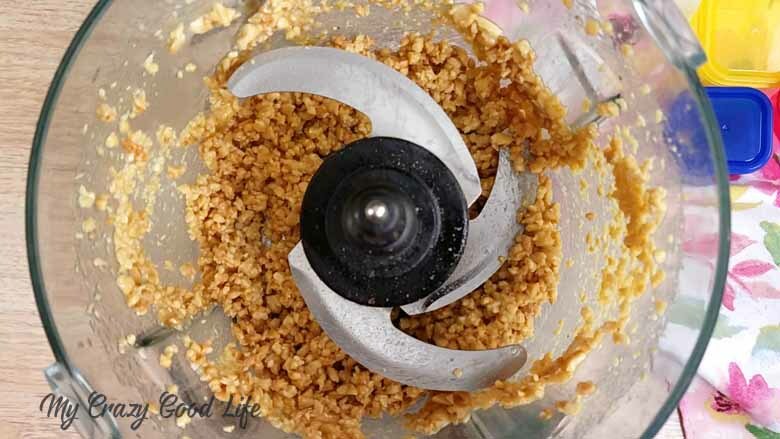 If you do not have a food processor you can also mix the ingredients with a hand mixer. 2) Grease the cups of your silicone egg bite mold. Pour the filling into each cup 3/4 of the way full. Tightly cover the silicone mold with foil. 3) Add 1 1/2 cup water to the bottom of the Instant Pot insert. Place the trivet at the bottom. Place the silicone mold on the trivet. 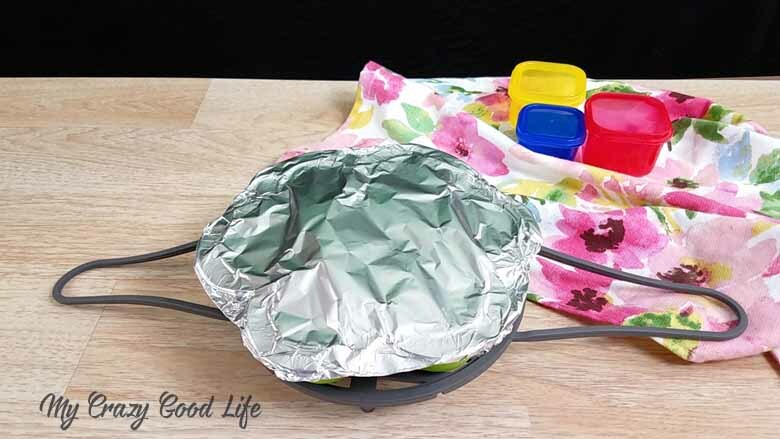 If you don’t have a trivet, you can easily make a foil sling by folding a long piece of foil to fit under your egg bite mold–just make sure the sides are long enough for you to lower and lift the molds out of the pot. 4) Close the lid and turn the pressure valve to sealing. Cook on high pressure using manual for 35 minutes. Let the pressure release naturally. Remove the silicone mold from the Instant Pot. Let the pies settle on the counter for 1 hour before adding the crust or moving to the fridge. They will be jiggly at this point. 5) In the food processor crush the peanuts and coconut oil. It only took about 20 seconds to crush the peanuts. Spoon the peanut crust over each key lime bite and gently pat down. Cover the key lime bites with aluminum foil and let chill in the refrigerator overnight. 6) When you are ready to serve just pop out of the mold, place them on a place crust side down, and top with homemade coconut whipped cream (recipe below) and key lime slices. 1) In a food processor, crush the peanuts and coconut oil together (it took me about 20 seconds). Spoon the peanut crust over each key lime bite (remember, they’re still in the molds) and gently pat down. Cover the key lime bites with foil and let chill in the refrigerator overnight. 2) When you are ready to serve just pop out of the mold, place them on a plate crust side down, and top with homemade coconut whipped cream and key lime curd or slices. 1) Open the can of cold coconut cream and separate the milk from the cream (the cream is solid and the milk is watery). 2) Place the cream in a chilled small bowl. Add the stevia. 3) Beat the coconut cream with a hand mixer for 1-2 minutes until it is soft and has a whipped cream like texture. 4) Store in the fridge until ready to use, but know that you should make it the same day you’ll use it. Can I make these custard bites in the oven? You sure can! If you don’t have an Instant Pot, not to worry. 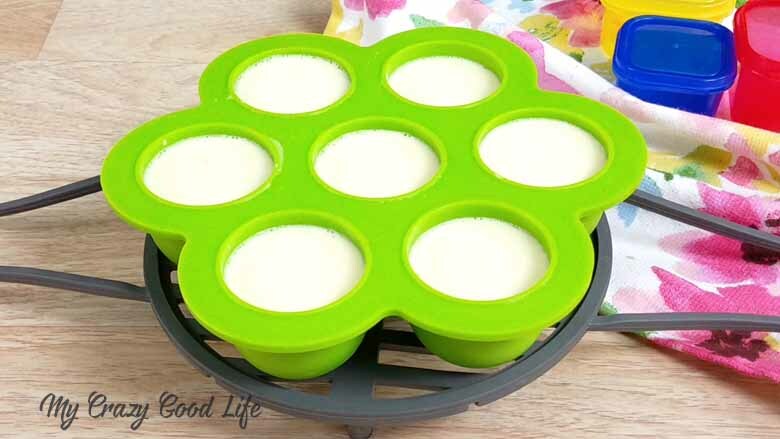 You can make these healthy key lime custard bites in the oven. The directions are included right here so you can use whichever method suits you best! 3) Preheat the oven to 325 degrees. Place the silicone molds on a baking sheet to easily move them to the over. Bake the key lime bites for 45-50 minutes. 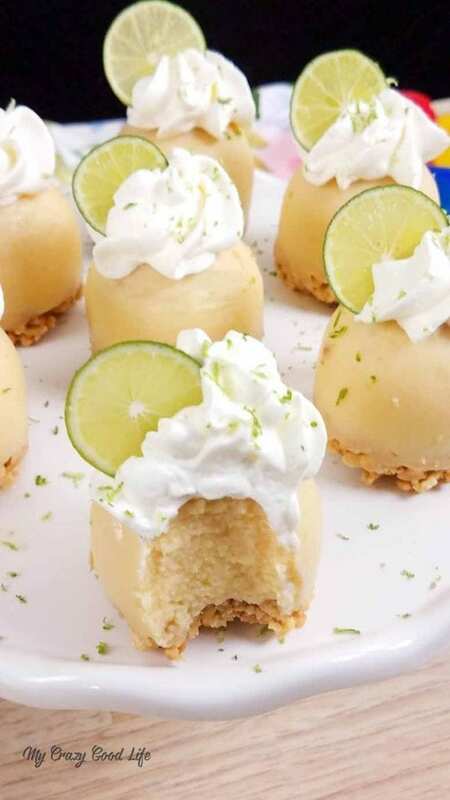 4) When the key lime bites are done let them settle for at least 1 hour before adding the crust or moving to the refrigerator. They will be jiggly at this point. 5) In the food processor crush the peanuts and coconut oil. It only took about 20 seconds to crush the peanuts. Spoon the peanut crust over each key lime bite and gently pat down. Cover the key lime bites with foil and let chill in the refrigerator overnight. 6) When you are ready to serve just pop out of the mold, place them on a place crust side down, and top with homemade coconut whipped cream and key lime slices. In a food processor mix together all the ingredients for the filling. If you do not have a food processor you can also mix the ingredients with a hand mixer. Grease the cups of your silicone egg bite mold. Pour the filling into each cup 3/4 of the way full. Tightly cover the silicone mold with foil. Add 1 1/2 cup water to the bottom of the Instant Pot insert. Place the trivet at the bottom. Place the silicone mold on the trivet. Close the lid and turn the pressure valve to sealing. Cook on high pressure using manual for 35 minutes. Let the pressure release naturally. Remove the silicone mold from the Instant Pot. Let the pies settle on the counter for 1 hour before adding the crust or moving to the fridge. They will be jiggly at this point. In the food processor crush the peanuts and coconut oil. It only took about 20 seconds to crush the peanuts. Spoon the peanut crust over each key lime bite and gently pat down. Cover the key lime bites with foil and let chill in the refrigerator overnight. When you are ready to serve just pop out of the mold, place them on a place crust side down, and top with homemade coconut whipped cream and key lime slices. Preheat the oven to 325 degrees. Place the silicone molds on a baking sheet to easily move them to the over. Bake the key lime bites for 45-50 minutes. 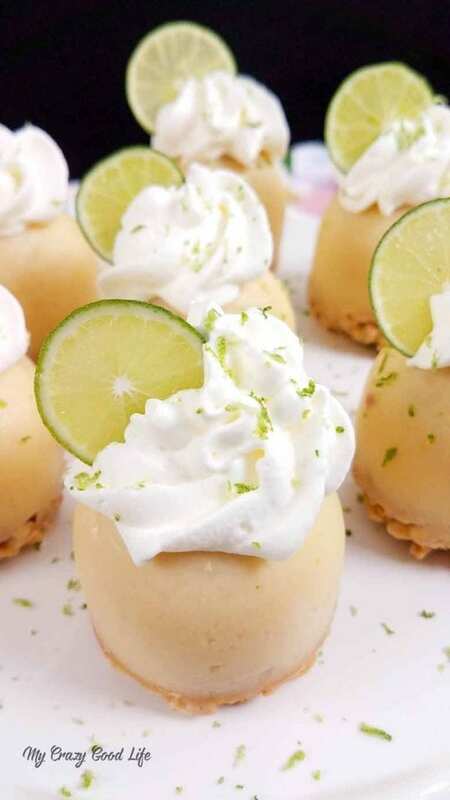 When the key lime bites are done let them settle for at least 1 hour before adding the crust or moving to the refrigerator. They will be jiggly at this point. Open the can of cold coconut cream and separate the milk from the cream. The cream is solid, and the milk is watery. Place the cream in a chilled bowl. 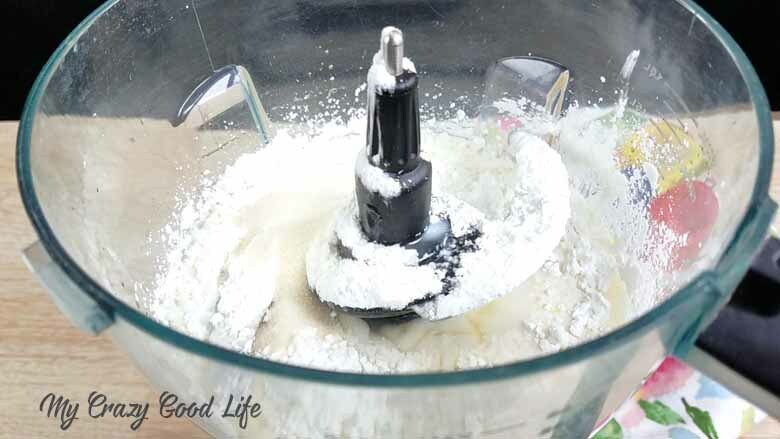 Beat the coconut cream with a hand mixer for 1-2 minutes until the coconut cream is soft and has a whipped cream texture. Store in the fridge until you're ready to use it, but be sure to use it the same day you make it. I adore key lime anything! I can’t I can not wait to try your recipe! I also pinned it to Pinterest. How cute are these! I love that they’re healthy too, less guilt when I want to enjoy more than one! I tried these. They taste good, but they didn’t set properly, too runny. Any ideas on what I did wrong? I did mix the ingredients with the Vitamix instead of a food processor. I did cook them in the IP, wrapped with foil, let them sit for an hour before adding the crust, topped again with foil and let set overnight in the fridge. No, I wonder… hmmm… could high elevation be a factor? I can’t imagine that a Vitamix would cause any issues! Hello – This looks great! I’m wondering if you could use chia seeds rather than gelatin to get the consistency… have you tried this??? I haven’t tried it, but it’s a great idea!